Envisioning possibilities, being committed, establishing an unwavering focus and nurturing belief in one’s potential has been a forte for the students of K.R. Mangalam World School, G.K-II. Keeping up the eminence and splendor, the school observed its Scholar Badge Ceremony on November 3, 2018 to felicitate a multitude of meritorious scholars of classes V, VII, IX and XI who achieved excellence in academics in the session 2017-18. The solemn ceremony commenced on an auspicious note by invoking the blessings of the invincible Almighty and chanting of the Saraswati Vandana along with the ceremonial lighting of the lamp by the panel of distinguished guests. The function was presided over by the Chief Guest of the day Smt. Vijayanta Arya, IPS, DCP, South Delhi region. The Principal, Dr. Sangeeta Arora formally welcomed the distinguished guest and the august gathering. She congratulated the students for their laudable feat in academics and exhorted the need to be indomitable and focused which would facilitate the students excel in fulfilling their aspiration. She further encouraged the young scholars to be go-getters and carry forward the progressive values, keeping the banner of K.R. Mangalam World School, G.K- II fly high. 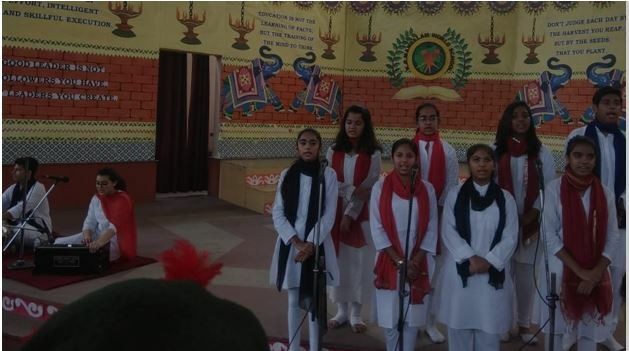 This was followed by mellifluous classical rendition ‘Tu Samay Ki Reth Par’ sung by the gifted singers of the school. The Chief Guest Smt. Vijayanta Arya congratulated the scholars for their stupendous performance and emphasized upon the fact that with acknowledgment comes accountability and one should shoulder the mantle of excellence that he/she has chosen. It was indeed a proud moment for the parents of the young scholars seeing their wards receiving their honours. Students who were awarded scholar badges for six years were awarded the scholar tie as a hallmark of true academic genius. The ceremony also was a witness to the energetic, graceful and mesmeric musical ballet ‘Conglomeration’- a unifying dance performance where the endowed dancers took everyone through the spiritual journey of the life of Krishna, the living embodiment of the blissful self. This was followed by a spell-binding melodious performance by the students of the Senior School, which was applauded by one and all. The ceremony culminated with the vote of thanks by the Senior School Coordinator, Ms Ritu Sachdeva followed by the National Anthem.